"We've passed on all we know...."
What do you think of the trailer? Let us know in the comments! Star Wars Episode IX: The Rise of Skywalker hits theaters on December 20th, 2019. 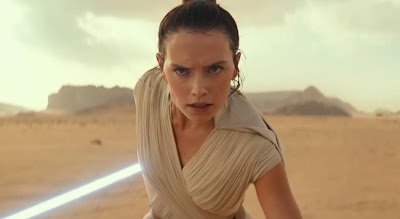 The film is directed by JJ Abrams, with a script by Abrams and Chris Terio, and stars Daisy Ridley, Adam Driver, John Boyega, Oscar Isaac, Kelly Marie Tran, Mark Hamill, Billy Dee Williams, Keri Russell, Richard E. Grant, Naomi Ackie, Lupita Nyong'o, Domhnall Gleeson, Joonas Suotamo, and Carrie Fisher. So then is Rey a Skywalker or is there another Skywalker? I was hoping JJ wasn't going to retcon what Rian did in TLJ. Wow, this is awesome. Looking forward to the end. Or not? Hmmm do not know how to feel. Great teaser. I would like to thank every one who worked on every film for giving me hope, excitment and awesome entertainment. My thoughts and prayers go out to those who pased away. Forever in my heart Star Wars. I have to assume it is referring to Kylo since he is technically a Skywalker. Or the production team lied when discussing Rey's family leading up to TLJ. The Rise of which Skywalker, who is that Rey, Luke, Kyle or Plagueis? Also my first thought was the hackle laughter was Snoke not Palpie which means JJ could have brought Plagueis into the mix and he is Anakins Dad hence the rise of Skywalker !! I can't wait. I cried when I saw Leia and Lando. The idea that we may end up dealing with the Emporer is awesome. I'm loving this. Technically Kylo Ren is a Skywalker. He's Leias son and she is a Skywalker. Ya'll know that Leia was a Skywalker too right...? Rey isn't skywalker. It is probably reference to darth vader coming back or something. Though that laugh at the end was palpatine. I'm 77 and have been a fan of science fiction since Flash Gordon, Forbidden Planet, Lost in Space, Star Trek and of course Start Wars... please let there not be an end to these stories!! Please!! Is Ren a Skywalker? A yes answer was certainly foreshadowed in episode 7 when Luke’s light saber “chose” her. But who knows for sure? Why does everyone assume Rae is Luke's daughter? She might as well be Leia's for all we know? Kylo's sister. Would make a lot of sense seeing the connexion they have, maybe even twins. I am growing tired of the same film plot being rehashed over n over!!!! I love the original trilogy. Honestly, I would rather watch Rick and Morty!!! Great show!!!! Always had a hunch she was Han and Leia’s !! So many subtle hints throughout the previous two films , as well as how she and Ben are able to connect with each other... this is going to be awesome!! Good trailer but laugh at the end is soooo old school. The first Star Wars taught me I can succeed at anything I want and be who I want to be. Until that movie, I never knew anything other than doing and being as I was "told." I watched that movie 4 times over and every Star Wars since. This trailer is incredible! Did you notice the “End Of A Saga” line???? Does that mean this is the last movie??? Rise of the Skywalker, AGAIN?? wouldn't something like "A New Order" or something simple, like "Uprising" or "Jedi Ressurection" be better? LAAAAAA-ME! Kylo REN is a skywalker. Why can’t it be him turning to the good and setting things right? The most misquoted line in cinema history! "No, I am your father!" She's re-constructed her lightsaber, probably read all of the Jedi books, maybe received some Yoda instruction. Now, to figure out why the universe's population keep allowing dark lords to rule? She may never know the answer, because she is too much part of this process. As are we all . . .